Hello Guys, We sharing some beautiful and funny dialogues from movie Poster Boys. The film has released now. The movie got great response from audience. This film is co-produced and directed by Shreyas Talpade making his directorial debut. 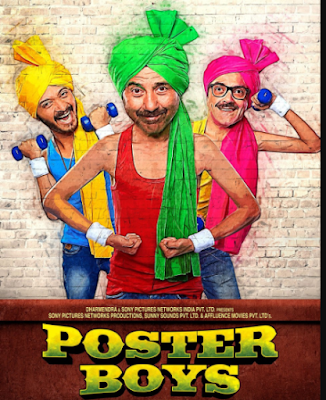 Sunny Deol, Bobby Deol, Shreyas Talpade are playing lead roles. The film is an official remake of the 2014 Marathi hit Poshter Boyz which Shreyas had produced and acted in. This film is inspired by a real life incident about three porters who found their pictures on a vasectomy poster. Sunny Deol portraying the role of a retired army man who looks perfect and showing his He-man image here. After long time Bobby Deol has came back to Bollywood by this film and he is playing the role of school master. Overall all movie is awesome, gave a good messages to our society. This film has also so many funny and comedy scenes are available with funny dialogues which are delivered by all actors. Here we have collected some best dialogues of this film Poster Boys. "Jwalamukhi vaise toh teen prakar ke hote hai ... Shant jwalamukhi, yeh kabhi nahi phat'te ... jagrut jwalamukhi, yeh bewajah hi phatte hain ... Aur prasuk jwalamukhi, yeh upar se toh shant dikhte hai par jab phatte hai"
"Aap toh fauji ki jagah man mauji nikle"